When Jonah Lomu passed away on the 18th of November, 2015, the rugby world lost its first global superstar, a rampaging winger from Auckland who was seen as an international icon as much as he was a rugby player. Lomu's death from a heart attack linked to a long suffering kidney condition was met with a public memorial service at Eden Park, the home of the Auckland Blues, where thousands of fans, players, family members, coaches, officials and friends gathered to mourn a man who was many things to many people. Friend. Teammate. Hero. Husband. Father. No. 11. New Zealander. While rugby may have lost Lomu, one of the game's greatest ever players that day, Brayley and Dhyreille Lomu lost their dad, Jonah. In response, the New Zealand Rugby Players Association (NZRPA) established the Jonah Lomu Legacy Trust to care for the two boys in the absence of their father. “It appears that because of Jonah’s well-known generosity, he had taken on obligations, financial and otherwise, to support others at the expense of himself, Nadene [his wife] and the children. Lomu left this world providing it with many great rugby memories, but he also left it in a position where he was unable to provide for the future of his family. Bad business decisions, ongoing dialysis treatment, and his deteriorating health left his family in a vulnerable state, a position that the French Rugby Federation (FFR) exploited on Monday when they presented their official bid to host the 2023 Rugby World Cup to the World Rugby Council in London. 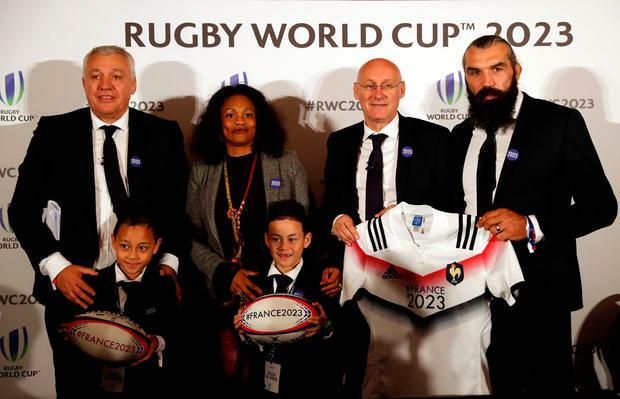 The French delegation in the English capital included bid president Claude Atcher, FFR president Bernard Laporte, France's Minister for Sport Laura Flessel, iconic former French backrower Sebastian Chabal, and strangely Lomu’s sons, Brayley and Dhyreille. The boys presence naturally prompts the question of why would two kids living in New Zealand join a bunch of adult strangers at a World Rugby council bid presentation on the other side of the globe? The cynic in me suggests there’s some sort of sizable financial incentive for their attendance, but the French say it’s to offer their support to a country that made their deceased father ‘happy’, after Lomu spent the final season of his professional career with French Fédérale 1 side Marseille Vitrolles. Speaking of the boys presence with each kid sitting either side of his lap, Chabal said: “Dhyreille was born in France, born in Marseille, when their daddy came over and played for Marseille. “And as he told us earlier, quite simply, he’s known as the Frenchie at home. “Jonah Lomu loved France. That’s where they saw their daddy playing rugby. Today I speak in their name. “They said they would love to come back in 2023 to experience the World Cup in the country where their father was so happy. French rugby federation (FFR) president Bernard Laporte also hailed the Lomu boys' appearance, saying: "It is very moving to have them with us, very good of them to have come all the way from New Zealand." Moving to some. Disturbing to others. These Rugby World Cup bid presentations are a pivotal part of the bidding process and help determine the next Rugby World Cup host. They provide a platform where a lot of the questions that need to be answered can receive official responses from key players, and there are questions that need to be answered in areas such as venue concerns, accommodation requirements and the extent of government support, or a seeming lack thereof in France's case. There’s also a large degree of marketing involved, as unions effectively try to sell a country and its internationally perceived image of itself to the world. But if I’m selling Ireland to the world, Bono on stage with U2 at Croke Park and Bob Geldof reading from sections of W.B. Yeats’ famed poem ‘Lake Isle of Innisfree’ isn't exactly at the top of my personal list of preferred representatives, but that doesn’t mean that they don’t serve their purpose. You may not buy your clothes at Carrolls but that doesn’t mean that others won’t when they're here. Perception is everything, especially when you’re selling an image to an international market. But when that image involves bringing world rugby’s most famous player’s kids halfway across the world to exploit some sort of tenuous emotional link to your country, you’ve crossed a line. Marketing Bono, Bob Geldof and Liam Neeson in videos is one thing, throwing Brayley and Dhyreille Lomu into a press conference is something else entirely. When you advertise #France2023 on your playing jerseys and offer to pay £30m over the tournament hosting fee, it's just desperate. But when you pluck two kids out of a country on the other side of the world and drop them into the middle of your facade to accentuate their link to their deceased father, it's just desperately insensitive and depressingly sad.